• Short subjects. I’m grateful beyond words that the coming of home video has made it possible for me to enjoy the adventures of Bugs Bunny and Wile E. Coyote at will in the comfort of my living room, but the only way to properly appreciate animated cartoons is to view them one at a time in a theater, screened in tandem with a full-length film. I’m just old enough to remember theatrical short subjects, and I loved it that you never knew what you’d see from week to week. It wasn’t at all uncommon for the cartoon of the week to be more interesting than the feature that followed it. Can you imagine strolling into a movie house in 1947 to see Good News or Lady in the Lake and finding yourself confronted with something as bizarre as Tex Avery’s King-Size Canary? • Rooftop TV antennas. I don’t miss the lamentably fuzzy reception that they provided, or the fact that my family could only pick up three channels in Smalltown, U.S.A. (I never saw a public-TV program until I went off to college in 1974.) 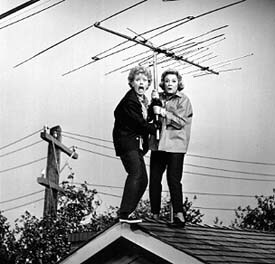 On the other hand, I loved being able to climb onto the roof of our house via the antenna pole. To do so was a hanging offense at 713 Hickory Drive, mainly because it terrified my mother, who was sure–not without reason–that her hopelessly clumsy son would fall off the roof and break his neck. I never did, but it’s a wonder that I didn’t. Could it be that I secretly envied those adventurous classmates who, unlike me, broke an arm or a leg at play and thereafter were privileged to wear a plaster cast on which all their friends scribbled messages of good cheer? I wouldn’t be at all surprised. My World and Welcome to It, which made its debut on NBC in the fall of 1969, ran for less than a year, but I watched every episode, and marveled at the deftness with which the show’s creators transformed the cartoons and stories of James Thurber on which their scripts were based. A decade later I had the good fortune to meet William Windom, who was touring in a one-man show in which he played Thurber, and told him how much the series had meant to me. I could tell how surprised he was that it had made so strong an impression on so young a person. 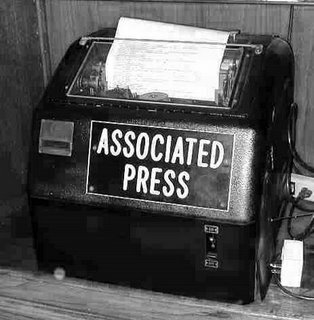 If Uncle Walter got his news from an AP teletype, you knew it had to be true. I found teletypes unimaginably romantic, and was disappointed to find that computer terminals had rendered them obsolete long before I landed my first full-time newspaper job in 1987. Now they belong to the ages. After the last firecracker was lit and tossed, I crawled into the wooden swing on the crumbling front porch of my grandmother’s house and rocked in the breeze. Once in a while I brought a book with me, for there are few things as pleasant as reading a good book while sitting in a porch swing on a breezy summer day. More often, though, I left my book in the car, especially after my spindly legs grew long enough to reach the concrete floor of the porch. Then I would sit at the very edge of the broad wooden seat, kick as hard as I could and push the swing higher and higher into the air, high enough that the soles of my sneakers scraped the ceiling and the heavy chains of the swing gave off a scary thump every time I fell back to earth. The higher I swung, the surer I was that the rusty bolts would gradually work their way out of the rotten wood of the ceiling, sending me flying through the air to a bloody but glorious death. Before long, one of the old people always came stomping out of the house and told me to cut it out before I cracked my fool head open. 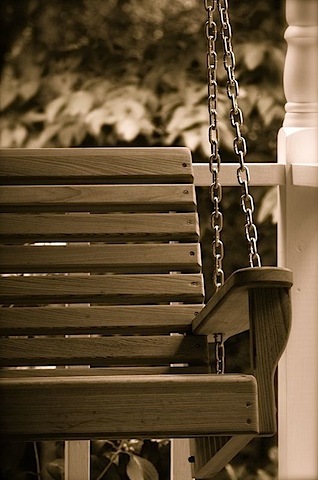 The house is still there, but the swing, like my youth, is long gone.